The first map to depict Manhattan as an Island and the first cartographic depiction of North American fauna. 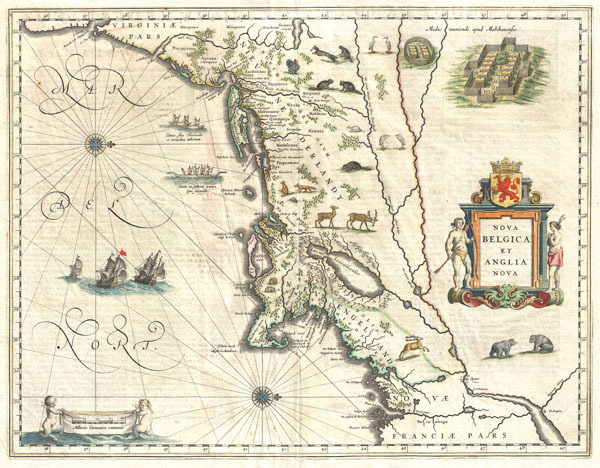 A beautiful old color example of one of the most important maps in the history of America, Blaeu's c. 1635 Nova Belgica et Anglia Nova. Oriented to the west, this map covers the American coast from Virginia, past New York and Long Island to Cape Code, New England, and Quebec. It is cartographically derived from data accumulated by Adriaen Bock and other Dutch fur traders active in the early 17th century. It is known for a number of important firsts, including the first full representation of Manhattan as an Island. It is of note that this map was issued in a number editions but only a single state. Editions are generally identified by the text appearing on the verso with twelve documented editions, three each in Dutch, Latin, German, and French. This example, though clearly in the Dutch series, does not correspond to any of the any of the editions sited in Burden and Koeman, and may be considered a rare undocumented edition (6 West-Indien. E). Blaeu, W. J., Theatrum Orbis Terrarum, c. 1635. Very good condition. Original centerfold. Dutch text on verso. Old color. Platemark visible.